· Eliza Wareham - she married John Swanston, from Selkirk, at Orange Street Chapel, Leicester Square, London in 1862. They then lived in Diss, Norfolk until they emigrated on board the "Firth of Forth" and docked in Wellington on 4th July 1878 with their nine children (6 girls, 3 boys). · George William Wareham was educated at Eton and at The Sorbonne in France. He emigrated to NZ with his brother TEW in 1879. Presumably having returned to England after TEW's death, he married Jessie Deveraux Harry in London 1882. She was the daughter of a High Court judge. They then emigrated to NZ in 1882, possibly on board the "Lady Jocelyn", and she died in Hawkes Bay 1910 and he died Taranaki 1926. Their first of five children, William Duvall Wareham (aka D'Arcy), was born in NZ 1883. This son also died in a terrible tree felling accident in 1902. Daughters, Mary Gladwys Wareham (aka Molly) and Annie Ellis Victoria Wareham followed in 1884 and 1887 respectively. 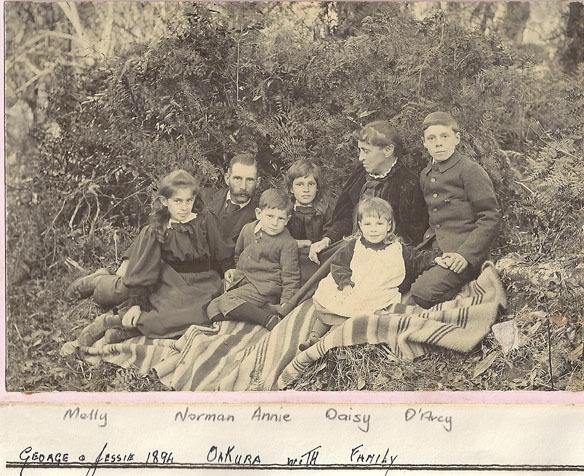 Norman D'Arcy Wareham was born in 1890 and, finally, Daisy Winifred Wareham in 1892. I understand that George became quite an influential farmer around Tataraimaka before they moved east in the early 1900's. He died in 1926 and is buried at Tataraimaka Cemetery, Taranaki. · Thomas Edward Wareham - emigrated and arrived at New Plymouth on 21st August 1879 with GWW. Four months later, aged just 17, he was dead. Killed while tree felling (see below). He died in Taranaki and is buried in te Henui Cemetery. · Emily Sarah Wareham - emigrated and arrived at New Plymouth with her husband, George Frederick Morris, in January 1880. A coroners INQUEST was held at the Police Office on Saturday afternoon before G. D. Hamerton, Esq., Coroner, and a jury of whom Mr. J. Shoolbraid was chosen foreman, in view of the body of Thomas Edward Wareham. George Wareham deposed : I am a settler living at New Plymouth, and I am elder brother of deceased. We arrived at New Plymouth from England on the 21st of August last, We have recently been engaged in falling bush for Mr. Thomas Brown, We were so engaged on Saturday morning, The deceased was cutting a tawn tree; at the base it was front 9 to 12 inches in diameter. I was working close by him. I heard the tree he was working at cracking, and I called him away. He replied that he was all right. I do not know whether or not he started to come to me, but the tree fell on him, hitting him on the head. The tree did not lie on him, but I think it must have crushed his head against a tawn which was lying there. He never spoke after the tree fell. He appeared to have been killed instantaneously. I tried to lift him up but could not, and then I went to some men who were working half a mile from us. Haggis and Bain returned with me, and with their help I brought the body into Brown’s clearing. The deceased was 17 years of age. From the time the tree started cracking I do not think the deceased could have escaped, as he was in the midst of the stumps, and had to pass the trunk which killed him. We had been about two months bush felling when the accident occurred. Frederick Haggis stated that he was employed falling bush for Mr Brown, and at 9 o'clock on Saturday he and his mate were called by last witness to see the deceased, He noticed that the head was completely shattered. There was a great quantity of blood near the body. He had known demised and last witness for the two months, and thought they were very cautious while at work. Constable Neville deposed that he went to Brown's clearing, and saw the body of deceased. He found the whole of the right side of the face and jaw broken ; the skull also was fractured. He brought the body into town. This concluded the evidence, and the jury returned a verdict of “Accidentally killed."